As of 11 am, the center of Hurricane Florence is located approximately 470 miles southeast of Emerald Isle. The Category 4 storm currently has maximum winds of 130 mph, and is moving west-northwest at 15 mph. Florence is expected to strengthen, and winds are expected to reach 145 mph on Thursday. The latest forecast track moves Hurricane Florence slightly south of Cape Fear, with a more westerly movement thereafter before projected landfall near Myrtle Beach on Saturday afternoon. Although this forecast track will slightly lessen the impacts in Emerald Isle, the impacts will still be significant in terms of wind, storm surge, and rainfall. According to the current forecast track, Florence is projected to be just 80 miles due south of Emerald Isle on Thursday night, with winds of 140 mph projected at that time. Most importantly, with Florence still 36+ hours from the North Carolina coast, any slight deviation from the current forecast track can result in landfall directly in or near Emerald Isle, with potentially devastating impacts. Even according to the latest forecast track (that projects landfall south of Cape Fear), the impacts on Emerald Isle will be significant. Emerald Isle is still anticipating tropical storm force winds for much of Thursday, and hurricane force winds for much of Friday. Significant rainfall is anticipated, with 20 - 30 inches of rainfall possible, regardless of track. A storm surge of 9 - 13 feet is possible, and there is potential for dune breaches and soundside flooding in all waterfront areas of Emerald Isle. These threats are very real, and should be taken very seriously! 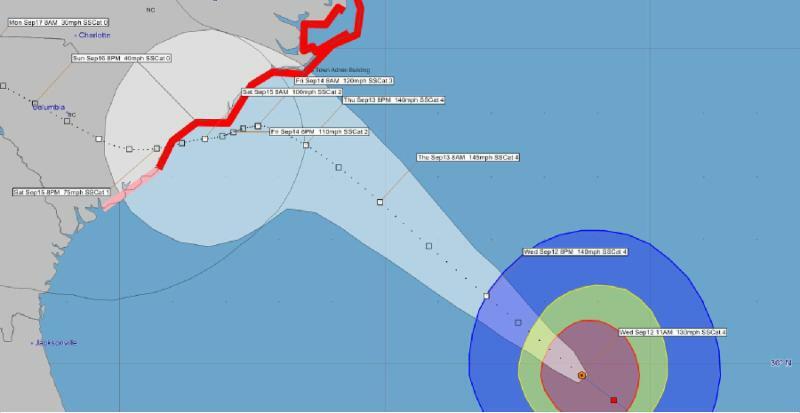 Emerald Isle is under a MANDATORY EVACUATION ORDER, and everyone should be leaving Emerald Isle now. All residents, property owners, and visitors are advised to evacuate Emerald Isle no later than 8 pm today. Because of the uncertainty of the forecast track and the projected tropical storm-force winds, Emerald Isle will still be under a curfew beginning at 7 am on Thursday, September 13. The Emerald Isle bridge will be closed at that time. No one will be allowed to enter Emerald Isle after 7 am on Thursday, until further notice. After the storm ends, Town officials will assess the conditions in Emerald Isle and make decisions based on public safety. Due to the fact that Florence is expected to stall somewhat, and the projected significant impacts on Emerald Isle on both Thursday and Friday, it is possible that the bridge will be closed for multiple days, and perhaps longer depending on the impacts on the ground. The curfew will be lifted and the bridge will be reopened only when Town officials have determined that it is safe for property owners, residents, and the general public to enter the Town. This information will be disseminated on the Town's various digital platforms listed below when these decisions have been made. Medically-fragile citizens should contact the Carteret County Emergency Management Office at 252-222-5841 or Emerald Isle EMS at 252-354-2249 immediately to arrange helpful assistance. Carteret County, thanks to the hospitality of Wake County, has also established an inland shelter for Carteret County residents in Knightdale, NC. The shelter is located at Knightdale High School, 100 Bryan Chalk Lane, Knightdale, NC 27545. The Town Administration Building will be open until 5 pm today, and will be closed on Thursday until further notice. The Community Center is closed until further notice. Trash will not be collected on Thursday or Friday.